1-2. 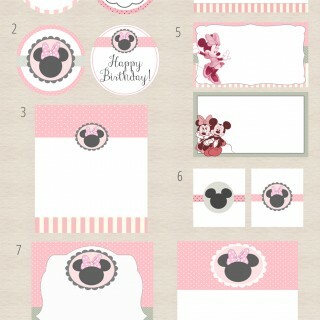 Minnie Mouse Happy Birthday cupcake toppers. I left the 2 blank so you can use it for other parties and put whatever you like in there. 4. Dessert Buffet tags. Use them as labels for the treats but I left it blank so you can also use it however you like. 5. Minnie and Mickey name tags. I made 2 designs for the kids’ name tags. One for the girls and the other one for the oys. 6. Game prize tags. For Patty’s party, I wrapped the prizes in kraft paper and I used these tags to sort out the prizes for the girls and the boys. It made it easier for the host to determine whether the prize is for girls or boys. 7. 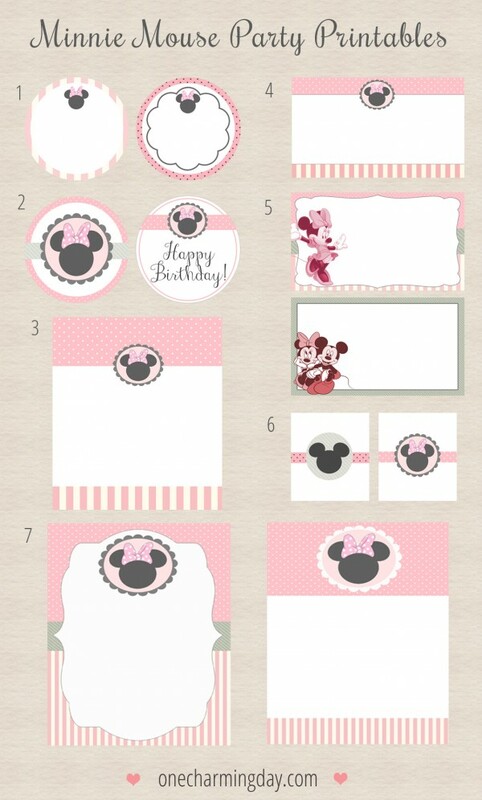 Minnie Mouse invitations. I left it blank so you write whatever you like to fit your child’s party. You can easily edit this using Word, Paint or Photoshop. 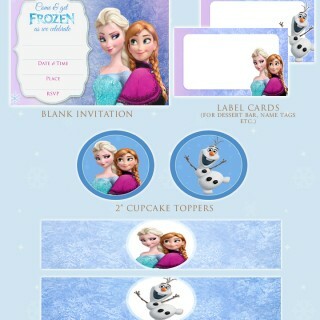 I am trying to download Minnie Mouse invitations and the link is not pulling up. The cake topper link is pulling up, so I hope the invites are still available!! Super cute!! You’re awesome! 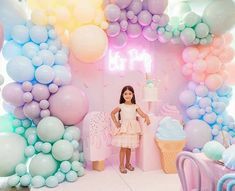 Thank you for your help to make my daughter’s bday special. No way to personalize the blank ones? I can’t seem to do it. Thank you! Thank you so much for this! 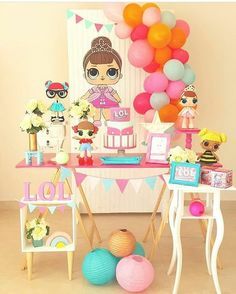 I used your printables for my daughter’s birthday. 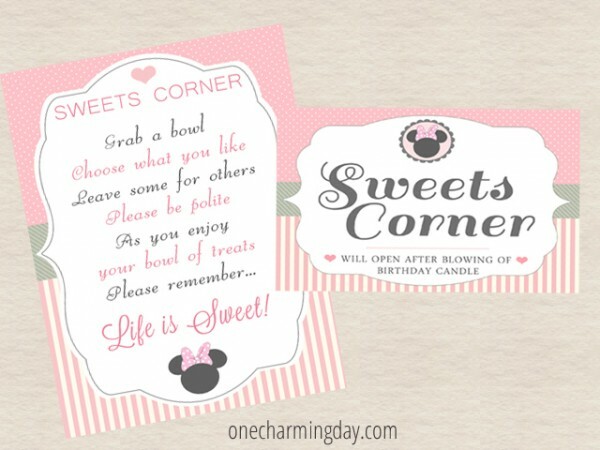 You can see the pictures on my blog http://www.loveangelissa.com/2014/04/a-minne-mouse-birthday-party.html. Thank you, once again for sharing! 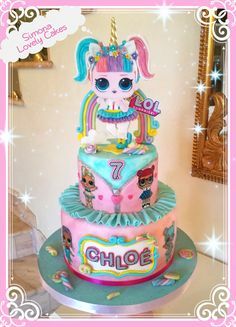 You made the birthday planning much smoother and fun! 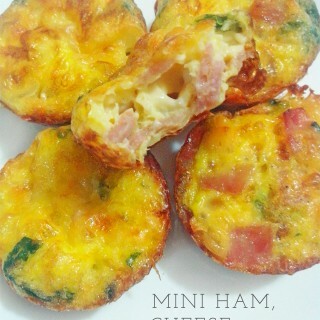 I absolutely love these!! Is there any way to change these to red instead of the light pink if I don’t have photoshop? Love these designs! Thanks for sharing with the rest of us! Just wanted to thank you from the bottom of my heart for providing these downloadable PDFs for FREE! They go perfectly with my daughter’s 1st Minnie Mouse Birthday Party that is on Saturday and you just saved me a bunch of time and money. I can’t thank you enough. I will take pictures. Just let me know how to get them to you. I am working on mine in picmonkey.com and I can’t figure out how to add those dotted lines… Any ideas? Been though a couple tutorials and can’t seem to find it there either. Hi, Brandi! I’m not sure if it’s possible to add the dotted lines using picmonkey.com. I used photoshop to add those for my daughter’s invites. hi there 🙂 love these printables, it let me save them but wont let me do anything with them once I open them? only options are to delete or set as background. any ideas why? thanks! Thanks so much for sharing ur beautiful free printables! 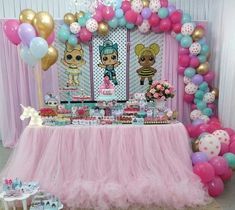 It really made my daughter’s second birthday so unique and stunning! See pics on my blog http://perfectlynormallife.wordpress.com and Pinterest on Perfectly Normal Life. 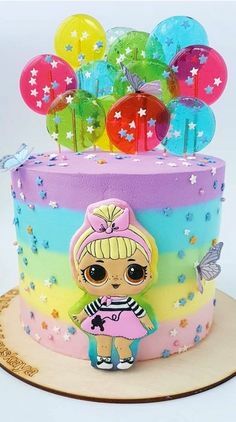 Love ur strawberry shortcake party!! Can’t wait to pin some pics! Hi I have downloaded but am not able to print, what am I doing wrong? Hi Sarah, what error are you getting? You should be able to open the files using Adobe Acrobat Reader and then print it from there as well. I am unable to open the file once I’ve downloaded. Please help!! Lovely designs. My niece would love it. 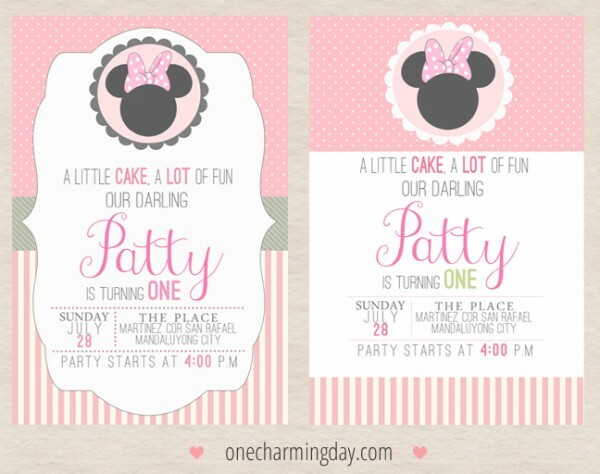 Thank you so much..
Hi, thanks for the printable minnie birthday invitation. How can I make the card printed on the both sides. 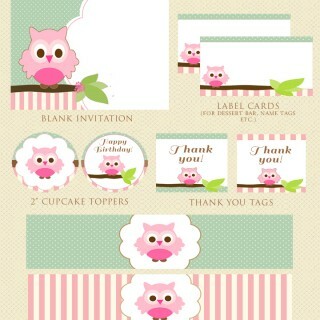 Do you have any design which can go at back of the card? Hi! this is jut what I needed for my niece´s Baby Shower, I loved the invitation you made for Patty, could you share the name of the fonts you used? Grabe ganda ng DIY mo ma’am! 🙂 Buti nalang nakita ko blog mo. Pwede ko po ba gayahin ibang ideas? Lalo na sa dessert bar. And ask ko lang po how much is cost lahat nyan? Or hiw much po dapat budget? Thank you and God bless!